Tanjung Benoa Beach is a white sandy beach with wide sea views. This is a coastal area and closely related to the life of fishermen. Visitors can still see the life of fishermen and rows of traditional boats in the north end. This beach is located in the northern part of Nusa Dua, precisely in Kelurahan Tanjung Benoa, South Kuta District, Badung Regency, Bali. The beach is close to Ngurah Rai International Airport and easily reached by car. Drive along the airport road and take the Bali Mandara Toll Road, and then continue on the Jalan Pratama. It's about 16 kilometers and takes 30 minutes in normal traffic. Along the Jalan Pratama lined exclusive hotels and resorts, restaurants, spas, moneychangers, clothes shops, and souvenirs. Some sources mention, initially in Tanjung Benoa there is a small port and became one of the trade routes. At this port the Chinese merchant sells ceramics and buys local produce of Bali. At that time, many people came to this area, both for trade and for work. Some of them settled, while others returned to their home areas. Until now there has been 5 (five) main ethnicities here: Tionghoa, Bali, Bugis, Java, and Palue (Flores). This beach is unlike other beaches in South Bali with big and powerful waves, which are favored by surfers. Here the waves are calm and very suitable for water sport. 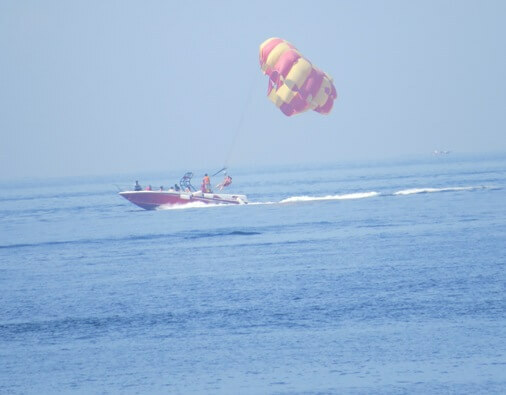 Water sport activity starts from 9:00 to 14:00, because after that time the seawater is not suitable due to the low tide. Some water sport activities you deserve to try are: Parasailing, Fly Fish, Banana Boat, Jet Ski, Tubing, Fly Board, Wake Boarding, Water Skiing, Knee Board, Sea Walker, and Glass Bottom Boat. To the west is Turtle Island (Pulau Pudut) used for turtle sanctuary. Visitors who want to explore this island can use glass bottom boat. In addition, visitors can also do other activities such as Snorkeling and Scuba Diving. To reach the spots, visitors will be escorted by boat. There are beautiful barrier reefs with sandy bottom and coral reef. Visitors can explore the nooks and crannies, hard and soft corals, and also various tropical fish species, coral fish, and even sea turtle.